The latest evolution of Sothys Desquacrem Forte now has twice the salicylic acid at 2% with added rice micro-grains for exfoliation and Lipo amino acid salts with Gypsophila extract for deep pore cleansing. Desquacrem Forte digests fatty excretions, enzymatically emulsifying oily impurities, comedones (blackheads) and milia (hard waxy deposits) that accumulate deeper in the tissues in a pH balanced formulation that deeply cleanses the skin without the skin feeling stripped, allowing more efficient penetration of serums and treatment creams. Gommage Exfoliant or Micro Gel peeling used prior to the application of Desquacrem Forte deep biological cleanser increases the efficiency of both products on all skin types. Used on all skin types (except very sensitive/reactive skin), Normal-combination skin, oily, skin, oil-congested (clogged) acne skin, hyper-pigmentation and ageing sun-damaged skin the product leaves the skin brightened and deeply cleansed and can be used conveniently in the shower. Using a small amount only (1/2 ml or a peanut size) disperse Desquacrem Forte with wetted fingertips over the entire face and neck area and massage for one minute with brisk circular action. Then allow to penetrate for three minutes before re-emulsifying with wetted fingertips and light massage movements to bring the product out of the skin, rinsing off several times until the skin feels free of the product. Use Desquacrem Forte 2 x week on normal/combination skin and 3 x week on oily/congested skin. This product unblocks pores better than any other product I have ever used. You just use a small amount once or twice a week. I had tried using desqucrem several years ago, and found the formula and especially the scent too harsh. I decided to try the new formula DCforte, and have had great results. I have very sensitive skin, but can tolerate using this once or even twice a week. The results have been great! 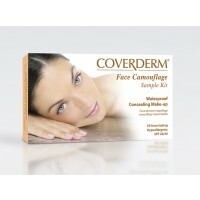 it stimulates the skin/pores to declogg. You just have to resist the impulse to help. Visible improvement in clarity and tone of skin over 6 weeks of use. I can recommend this product, even if you have sensitive skin, with once a week frequency. This is one of the best cleansers I have used. Leaves my skin feeling clean, smooth and refreshed and it is well worth the cost. I recommend this to anyone with mature skin. I've been using this product for around 5 years now, and I think it is well worth the money. It deeply cleanses and removes impurities, which is great for targeting my blackheads and congestion. It's also good to use after a night out when I wear more make-up than usual, to ensure the skin is cleansed. After using this product, my skin feels the same way as after getting a professional facial.